Every sale can be traced. Before e-commerce, the cashier at a small clothing boutique might ask customers at the register, “How did you hear about us?” The answer—a billboard, TV ad, newspaper article, what have you—would be a strong indicator of that shop’s customer acquisition channel. If nobody mentioned the TV ad, that ad could be considered a waste of money. Between Google Analytics, Kissmetrics, Mixpanel or any other number of analytics software, sales are more transparent than ever. But being able to compile the data is one thing; making sense of the numbers is another. Obviously, you want to save money on acquisition channels that aren’t working, and double down on channels that deliver new customers. But it’s not quite so simple: if your pay-per-click advertising efforts are bringing in 2,000 new customers a month for a spend of $2,000, are they worth the cost? Maybe your organic inbound traffic is only reeling in 1,500 new customers a month, but your monthly spend is $1,000. That would make inbound a far better cost per acquisition. 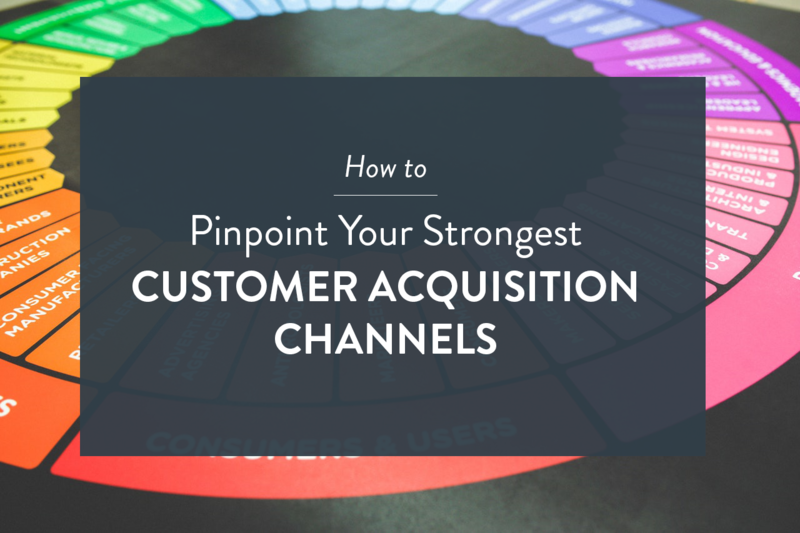 So how do you figure out your strongest customer acquisition channel? The first step is to set up a detailed path of goals (to use Google Analytics lingo) that will note any time a customer reaches a point of the journey you’ve laid out for them. Setting up these paths is crucial to understanding acquisition. Specificity is important: email traffic is notoriously vague unless tracking links are set up in newsletters, referral emails, discount codes, etc. Seeing that “Gmail” is your biggest source of email traffic is useless. Whenever possible, with each social platform and marketing campaign, set up a unique tracking system that will clarify how people found your content. Some businesses also offer a survey during a checkout, soon after or when a lead signs up with their email. This will obviously be incomplete data as not everyone will respond, but surveys can be useful tools for gathering this sort of information at a critical moment. Tally up all your marketing receipts for a given period (a month, a year, a quarter) and separate them by acquisition channel. You’ll have a huge swath of channels to deal with, but the biggest (and easiest to evaluate) will be hard costs such as social media, SEO, content marketing, PPC, outbound advertising and email marketing. Each one of those sectors will have a price tag attached to it. Get as specific as possible—if you can break down your social spend between Facebook, Twitter, Reddit and Instagram, then do so. Now you’ll need to match those spends against their results. Turn to your analytics software to monitor the active users you’ve received through each channel. Even if people don’t become paying customers, you might notice that they’ve engaged with your website enough to strike you as a promising lead. Make a note of how many users are engaged, as well as how many actually become paying customers. This will give you a solid rough idea of your strongest customer acquisition channels—but it’s far from complete, because it only shows you one piece to the puzzle. Customer acquisition isn’t a one-and-done deal. Repetition is key. Maybe referral traffic might lead to your cheapest new customers, but the benefits of SEO could be long-term, as people will read your content and appreciate your brand as time goes on. This is also why businesses tend to evaluate people in terms of their customer lifetime value (CLV), which estimates a customer’s value to your business over time. Determining a hard cost of acquisition using the spreadsheet model above is a start, but knowing that number is fairly useless unless you consider your other costs, including how much that customer is actually worth. Customer acquisition can be difficult to evaluate because, frankly, it’s sometimes vague. You might see a huge influx of sales from people arriving at your website directly—as in, just typing your URL in their browser—and leaving you wondering how they found your company in the first place. But the benefits to good PR can be long-lasting and far more influential than traditional outbound marketing. Moreover, it can be impossible to tell when it works. If someone reads about your dog-grooming business in the local paper and buys a dog brush online, they’ll likely be counted as a mysterious “direct” customer in your Google Analytics dashboard. And while you can’t calculate the value of that customer exactly, the value of appearing in an authoritative news source and having your brand mentioned to thousands of people is incalculable. So it’s important to never discredit channels, even if they seem like they aren’t your strongest. There may be indirect benefits that you don’t want to lose. Consistently measure the health of your customer acquisition channels so that when things go well, or things go awry, you can dive in and make intelligent adjustments.